When I first started leading the AMR Review in 2014, I soon came to the conclusion that, if the current model wasn’t delivering new antimicrobial drugs, the solution was obvious: launch a new public purpose-focused entity dedicated to developing and producing new antimicrobials. When I shared this hunch with others, I was advised that it couldn’t be done without the major pharmaceutical companies, as they were the only ones with the expertise to produce and distribute drugs. I let this idea drop from my mind. At the time, I wasn’t aware of GARDP, and at an early event of theirs towards the end of our Review, I remember joking that had I known of its plans and aspirations earlier, I might have stuck with my initial hunch. Given the intransigence of the major pharmaceutical companies , as well as the lack of government ambition in response to my Review’s ideas, perhaps GARDP can deliver the new drugs that the world desperately needs. The main purpose of the AMR Review was ostensibly to solve the “market failure” in the economic model for new antimicrobials. We quickly realised that obtaining new, affordable and effective drugs was just one of many things needed to solve the AMR challenge. Indeed, even if we find the right new economic model, we won’t solve the problem unless we do all the other things, especially reducing inappropriate usage. In its first benchmarking of AMR activity, the Access to Medicine Foundation reported in January 2018 that just eight major pharmaceutical companies were committed to producing antibiotics. Frankly, my Review team and I believed that only three were genuinely committed, and others liked to give the impression they were in the antimicrobial business but weren’t serious players. In fact, during the summer, it emerged that at least one of the eight had sold its antimicrobials business, and possibly another two aren’t far behind. Within another two years, there might not be any serious contenders left. Undoubtedly, by the standard framework that Big Pharma uses, the profitability of antimicrobials isn’t especially appealing. Throw in the growing recognition that marketing and distribution would need to be curtailed, then spending valuable resources on AMR doesn’t seem overly enticing. Maybe what we need is a more honest evaluation of the current situation; rather than overstating their commitment to antimicrobial R&D, pharma companies need to accept the problems and become part of the solution. But here is more reality. Is it sensible to have a compartmentalised model in which each business area is judged on its profitability, and often given the same profit hurdle? If it persists, then obviously antimicrobials won’t stand up well. But if we run out of antibiotics and have nothing left to fight infections, will Big Pharma even be able to sell many of their other highly priced treatments? So what are the advantages and disadvantages of the various models? Some of the bigger pharmaceutical companies have advanced two alternative solutions. The simplest is to be allowed to sell at higher prices, to cover the costs and risks associated with the development of useful antibiotics. This would present an obvious affordability problem, which would be a huge issue for masses of people. The second alternative, actively pursued by Big Pharma in the US, is for lawmakers to allow so-called “transferable vouchers”, enabling producers to negotiate patent extension for another drug of their choice (allowing for much bigger revenues) in return for re-entering the antibiotics business. This might be feasible in a prosperous market like the US. But it wouldn’t be applicable to many other markets, especially emerging market nations that have such affordability challenges. And while it might be efficient for the first pharmaceutical company in line, the benefits quickly diminish. Furthermore, who would judge how serious any supposed new effort to produce antibiotics might be? In the AMR Review, our preferred option was the idea of large prizes, or what we called Market Entry Rewards, where the successful producer of the appropriately mandated new antibiotic (or diagnostic tool, or vaccine) would receive a large lump sum payment, so long as they agreed to abide by clearly defined conditions for pricing and distribution. I don’t really understand why pharma hasn’t embraced this idea, and pushed for its trialling. Market Entry Rewards could be financed by the tax-payer, government spending or, as we suggested, through the so-called pay-or-play model. In this model, we raised the idea of a surcharge being placed on all pharmaceutical company sales, the proceeds of which would finance the prizes. In this regard, it would be industry self-financing. Companies actively trying to produce antibiotics would be exempt. The challenge here would be in distinguishing companies that were really trying to produce antibiotics. Alternatively, the surcharge could be placed on all producers, as the successful producers would win rebates through prizes. A concern raised by industry is the possible extension of the model beyond antibiotics. We were not surprised by this objection, but would simply argue that nothing compares with the broad relevance and importance of antibiotics. Then, of course, there is the alternative of a completely publicly owned producer. I guess GARDP can point out the benefits and challenges of this model better than me. I look forward to the day when a Big Pharma CEO happily tells their shareholders that they are truly committed to producing more antimicrobials and volunteers to pilot our recommended Market Entry Reward prize. I also look forward to the day when a major government (or the G20 collectively) says that is going to introduce Market Entry Rewards financed by a pay-or-play model. Maybe I should also look forward to another day, when the G20 say, actually we don’t need any of these guys, and decide to back my initial hunch! GARDP is on that journey. 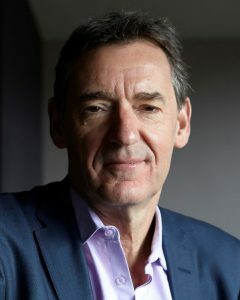 Lord Jim O’Neill is an internationally published economist, and until 2013 was Chairman of Goldman Sachs Asset Management, having previously been the organisation’s Head of Economic Research. Jim is particularly well-known for his work in relation to developing economies, having been one of the earliest (and most prominent) economic commentators to identify the enormous potential for growth by middle income countries during the first half of the 21st century. This deep understanding of global patterns of growth and economic development allowed Jim to comprehend the broad range of international interests and interdependencies at play within the issue of rising resistance to antimicrobial drugs; and equipped him to chair the Review on Antimicrobial Resistance from 2014-2016. Jim O’Neill was made a Life Peer and member of the House of Lords in May 2015 as Lord O’Neill of Gatley. He served as the Commercial Secretary to HM Treasury from May 2015 until September 2016 before leaving the government. The Review on Antimicrobial Resistance (AMR), was commissioned in July 2014 by the UK Prime Minister, who asked economist Jim O’Neill to analyse the global problem of rising drug resistance and propose concrete actions to tackle it internationally. The Review on AMR was jointly supported by the UK Government and Wellcome Trust, although operated with full independence from both. Established as a two-year, time-limited process, the Review engaged widely with international stakeholders to understand and propose solutions to the problem of drug-resistant infections from an economic and social perspective, and produced its final report and recommendations in the summer of 2016.